Nano-scale materials have unique electronic, optical, and chemical properties which make them attractive for a new generation of devices. 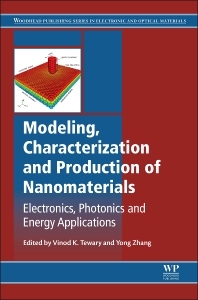 Part one of Modeling, Characterization, and Production of Nanomaterials: Electronics, Photonics and Energy Applications covers modeling techniques incorporating quantum mechanical effects to simulate nanomaterials and devices, such as multiscale modeling and density functional theory. Part two describes the characterization of nanomaterials using diffraction techniques and Raman spectroscopy. Part three looks at the structure and properties of nanomaterials, including their optical properties and atomic behaviour. Part four explores nanofabrication and nanodevices, including the growth of graphene, GaN-based nanorod heterostructures and colloidal quantum dots for applications in nanophotonics and metallic nanoparticles for catalysis applications. Postgraduate students and academic researchers in electronics, nanoscience and nanotechnology, physics, chemistry, material science and engineering; R&D managers in industrial sectors such as nanotechnology, nanoelectronics, semiconductors, sensors, energy, microsystems technology, optical materials and devices and carbon nanomaterials; design and test engineers working with nanomaterials and nanodevices.